Flautissimo is under the musical direction of Joanna Price. The group utilises piccolos, concert flutes (the flute most people are familiar with), alto and bass flutes, and a rare contrabass flute. Flautissimo members are usually at least Grade 5 standard, and include adults and young people alike. 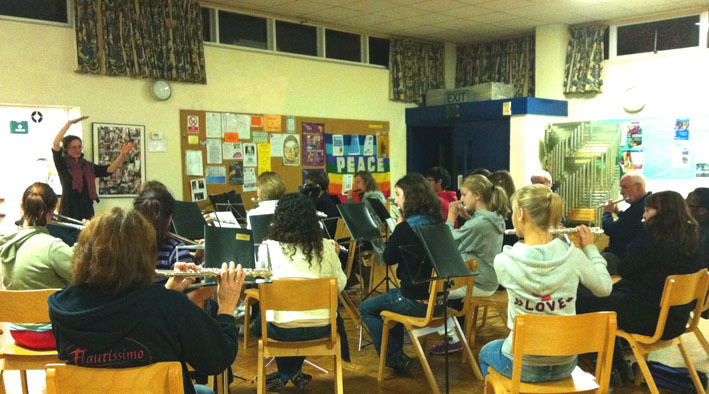 The group provides a unique opportunity in the area both for school/college age players who may wish to look for more ensemble experience, and experience playing other types of flute, perhaps with a view towards music college, and for adults to join a smaller, dedicated orchestra. 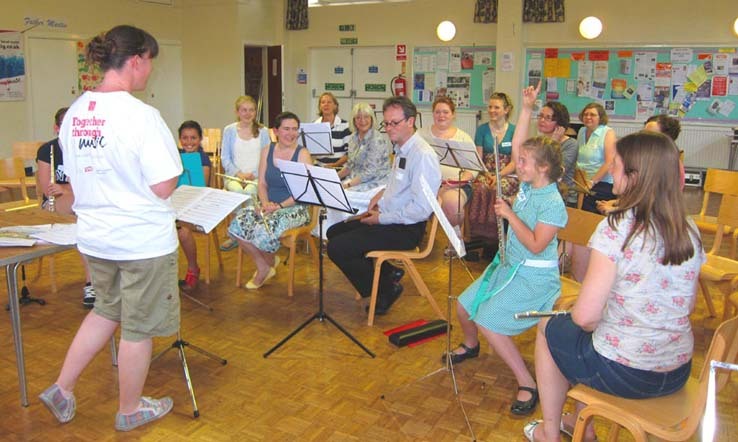 By being a member of Flautissimo you are able to access flute-specific knowledge and repertoire, many of our members are studying music or are local teachers who are happy to give you tips and advice - you might even be able to give us some in return! "It's like getting a mini flute lesson in each rehearsal, the warm-ups and explanations of technique are specifically for the flute which make them relevant and improve my flute playing." "I like the mixture of people that come to Flautissimo, they are all really friendly and love the flute!" "It's a nice way to unwind at the end of the week without taking up time from the weekend." "I come to Flautissimo because I love the music we play, and it's a chance to see my friends." Many of the works that Flautissimo play are arrangements of well-known pieces. Others have been composed specially for the flute orchestra. There is a long tradition of variety: for instance Christmas isn't all carols! Flautissimo perform in a black shirt emblazoned with the group's logo. For concerts members wear their Flautissimo shirt, black trousers and black shoes. Rehearsals take place on Friday evenings between 7pm and 9pm in the hall of the Church of the Immaculate Conception, Portswood, SO17 3SB. Rehearsals run during school term time and new members are welcome at any point in the year. Subscriptions are £30 per term for Flautissimo and £25 per term for Piccolissimo (come along and try us for free first) with three terms in a year, payable at the start of term. Piccolissimo players can also choose to pay £3 per session rather than termly. Bring your flute and a music stand. Please get in touch if you would like to join or find out more. Current and previous members may send a request to join the private Flautissimo facebook group to hear about socials, reunions, etc.